What is the future of the computing supply chain? Intel seeks answers. This post was originally published on the Digital Initiative’s public blogging platform, Open Knowledge as part of the 2017 RC TOM Challenge. Digitalization – specifically, the advent of artificial intelligence and the Internet of Things – has led to increased pressure on the computing supply chain. 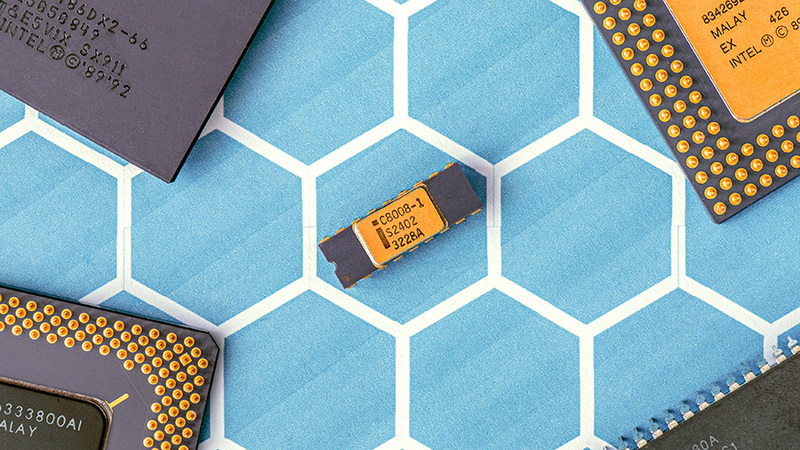 Chipmakers, in particular, have seen growing customer demand for greater computing power and product customization, as microprocessors are increasingly tested by complex algorithms across a widening variety of connected devices. This presents a challenge to Intel. The company first established dominance in the semiconductors industry by producing Central Processing Units (CPUs) for PCs, and currently has 80% share in the global market . 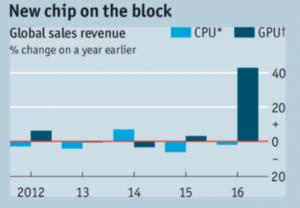 However, OEMs have increasingly shifted attention away from CPUs towards Graphic Processing Units (GPUs), threatening Intel’s stronghold as an Original Component Manufacturer (OCM) in the computer supply chain. Historically, computing power was determined by the number of CPUs and the cores per processing unit. CPUs tackle calculations in sequential order, with the number of CPUs influencing application performance and database throughput. The rise of AI has generated demand for processors that can perform matrix-based calculations in parallel process, such as GPUs. GPUs are better-suited to performing deep learning techniques such as neural networks and have accelerated AI integration in platforms from autonomous cars to Alexa. Nvidia is the current leader in GPUs and the category is growing rapidly within the chip market, per the chart below. Nvidia also continues to innovate and improve upon its product offering; its latest GPU units contain 3,584 cores, versus the 28 of Intel’s top-end CPUs . 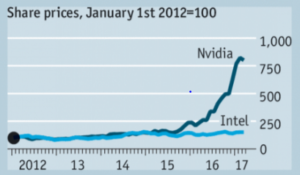 Correspondingly, Nvidia’s share price has risen in recent years, while Intel’s has remained stagnant, as seen below. The company risks falling behind if it does not respond and adapt to the changing demands of its customers in the supply chain. Intel has made efforts to expand their role in the microprocessor value chain, by acquiring intellectual property and talent (in the short term) and building out infrastructure to sustain product innovation (in the medium term). Responding to the rise in GPUs, Intel has made strategic additions to its organization to target the graphics market. In November 2017, Intel announced the hire of Raja Koduri, the former graphics head of competitor AMD. Koduri will run the new Core and Visual Computing Group to “design high-end discrete graphics for a broad range of computing segments” . Per Murthy Renduchintala, Intel’s Chief Engineering Officer, these changes are part of Intel’s “plans to expand [their] computing and graphics capabilities” given the acceleration of AI . However, Intel has also made acquisitions to advance their offering in the chip market, hoping to direct the AI supply chain away from GPUs. In December 2016, Intel spent $400 million to buy Nervana Systems and its machine learning assets, including a customized computer chip . 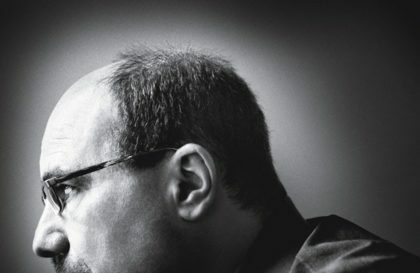 Intel lent its production might to Nervana’s proprietary technology and was able to bring an AI-targeted chip to market soon after – in October 2017, Intel CEO Brian Krzanich announced the launch of the Intel Nervana Neural Network Processor (NNP), the first silicon for neural networking processing . Intel could consider proactively partnering with its customers to position for trends arising from the adoption of AI and the ‘Industrial Internet’ . As businesses shift focus from products to outcomes (such as providing efficient cognitive computing), ecosystems are expanding and blurring the boundaries between software and hardware , presenting opportunities for Intel to collaborate and create AI-specific products with its computing customers. Google recently developed its own chip, the Tensor Processing Unit (TPU), in response to their own “fast-growing computational demands” . In-house development by OEMs poses a threat to Intel, as their chips may potentially be phased out of the supply chain. However, Intel could mitigate this – and possibly create more value within the computing system – by partnering with their customers. They could combine Google’s vision of AI with Intel’s expertise in chip design and manufacturing to produce customized processors and more. Partnerships would ensure that OEMs receive components tailored to their evolving needs and that Intel remains a relevant and defining player in the computing systems supply chain. As Intel looks ahead its place in the long term, it is worth asking: what is the future of the computing supply chain? Will there remain delineated OCMs and OEMs, or will there be a reversion to vertical integration? Or, much like the neural networks that yielded such change, will buyers and suppliers be linked through interconnected nodes, with the output of one informing the inputs of others? Chloe Ho is a student at Harvard Business School (MBA ’19) and has previously worked at such companies as Razorfish and Morgan Stanley.